The creation of a food and beverage website. 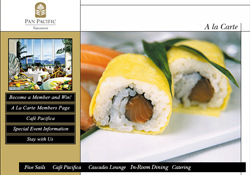 This website was designed for the Pan Pacific Vancouver. It is used by the Hotel as a marketing tool to promote their food outlets. This website also has an HTML newsletter that gets sent out to their club members with special offers.